113460 visits since Jan. 2007. How to use the shape selector? 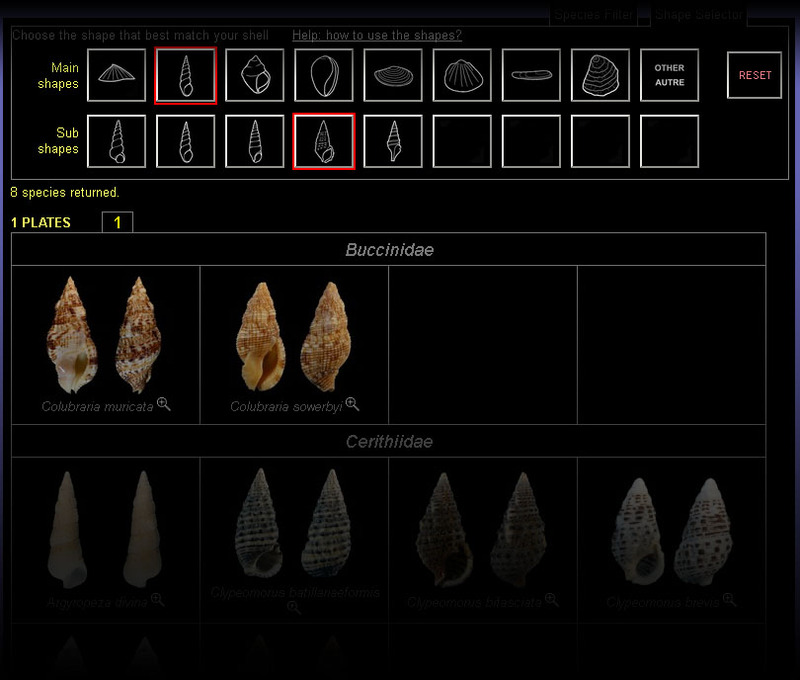 This tool has been built essentially to ease and accelerate the identification of a shell from the species recorded in the Conchylinet database. When clicking on a main shape, the related sub-shapes will be displayed. You have to choose and click one of these sub-shapes to filter the plates accordingly. To deactivate the shape filtering, just click the RESET button on the right. Note that if the shape you selected does not match any species already filtered by the specie filter, the result will be nothing! Notes: the number of shapes has been limited to avoid too much complexity for the novice collector trying to identify his shells. Moreover, the specie shapes have been set arbitrarily, you may not agree with some choices done to a specie. Feel free to send comment about it and propose more relevant shapes drawings.